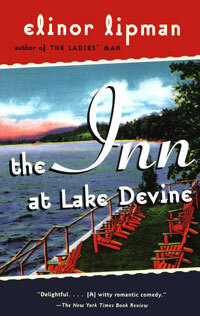 The Inn at Lake Devine is the sort of book that works best in summer, I think. Look at that cover! Wouldn't you love to sit on one of those lawn chairs along a placid lake, watching the sunset? I certainly would. Except that I wouldn't be allowed to, of course, because the Inn at Lake Devine is for Gentiles Only. Natalie Marx is stunned when she hears the news. Her family wants to vacation somewhere pretty for the summer of 1960-something, and they ask for lodging at Lake Devine, as people keep raving about Vermont. But the reply is clear - yes, we have availability, but no, not for you. As it's only about 15 years after the end of World War II, Natalie goes on a one-teenager mission to educate the proprietor of the inn, Mrs. Berry. She sends anonymous news clippings, quotes Anne Frank, registers at the inn under false names of Gentiles who committed horrible, heinous acts. And then one day, a distant friend named Robin invites her to go to the inn with her family, and Natalie accepts. She wants to know what happens at such an exclusive resort. Not much, she finds, and loses touch both with her friend and her experience at the inn. But ten years later, Robin invites Natalie to her wedding at the Inn, and from that point on, Natalie's life is tied to that of the Inn at Lake Devine. 1. Jewish girls have (had?) a reputation for being "easy" as long as you pay them enough compliments. 2. The Catskills are full of hotels and resorts that cater to Jewish travelers. 3. The "American Plan" refers to lodging that provides you with three meals a day. But now I am well-versed in the cultural norms/stereotypes expressed above! The Inn at Lake Devine is a fun book. It's very funny, quite sweet, and even if it became very odd at some points, like when there was a totally unexpected case of severe mushroom poisoning and hospital hallucinations, it was an enjoyable read. Natalie is a great narrator to take us happily through the story, interspersing conversations with her own wry asides and introducing her to Jewish culture in a way that is gently mocking but clearly very affectionate. Her family is very tight-knit and supportive, and the inquisitive nature and funny foibles of life at a Jewish resort are contrasted lightly against the experience that Natalie had at the Inn at Lake Devine. The anti-Semitism angle is explored in detail, but not so much to overpower the story. In some ways, I thought Lipman took the easy way out. For example, is it likely that the husband and sons of an Anti-Semite would be so kind and generous and thoughtful and completely blind to race? Doubtful. But then, as another character points out, so many people are blind to race because they're used to being in the majority. They never feel like a fish out of water because, well, they are so rarely out of the water. Mrs. Berry is presented as an unkind, selfish, and completely unsympathetic character. I think there could have been so much more nuance there if instead, her character was kind to her family and well-loved by the inn's visitors, but also completely set in her prejudices. But then this would have been a different story and probably not nearly as funny. So, instead, I salute Elinor Lipman for bringing attention to a serious issue by presenting us with a happily-ever-after comedy. Well done! This does sound like it's fun and serious all at the same time, so I am interested. I don't even know why there would be a hotel that only caters to gentiles, and that for some reason, makes me very mad, but also really curious to find out about how Natalie deals with the news. Very nice review today. You hit all the highlights without spoiling a thing! I'm glad! It wasn't ground-breaking or anything, but it was fun. I don't think I've ever actually known what this book is about. I've passed it over in the past but given your review, I'd be far less likely to pass it over again. Thanks for your thoughts, Aarti! Sounds like a wonderful summer read - fun but gives uyou a little something to think about too. This is I think my second favorite of Elinor Lipman's books. It's definitely a bit fairy-tale in resolution, but I don't think the thing you mention -- the father and sons being sweethearts and the mother being a racist jerk -- was necessarily unrealistic. I've known families with that sort of dynamic. Oh, really? Interesting. I wouldn't have thought that was common at all, but I'm glad to know that I'm wrong. I still think the mom was too one-dimensional, though. I have this book on my to-read list but I think I'd forgotten what it was about, and your review definitely does renew my interest in it. Your mention of Jewish resorts in the Catskills makes me think of the movie A Walk on the Moon with Diane Lane, which is set in such a summer resort in the 1960's. I've not seen that one! I'll have to look into it.